Director Wes Anderson and composer Alexandre Desplat continue their collaboration with their most recent film, The Grand Budapest Hotel. This of course following Fantastic Mr. Fox (2009) and Moonrise Kingdom (2012), with 'Fox' nominated for an Oscar, and 'Kingdom' with only about 20 minutes of original score. 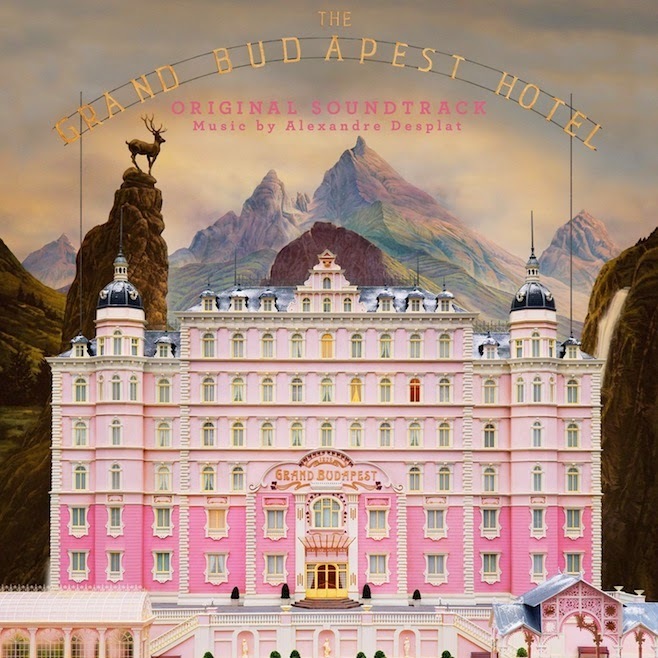 With The Grand Budapest Hotel, we get more orchestral score than probably ever in a Wes Anderson film. Included are some Russian folk melodies, which compliment the Desplat score. Here is my rundown of the album, no spoilers except in track titles. The album begins with s'Rothe-Zäuerli (performed by Öse Schuppel). Say that ten times fast. It's a nice vocal track that sets our ears to the Alpine-style music we'll hear on the album. Alpine horns begin the score in the short track, The Alpine Sudetenwaltz. Mr. Moustafa is a charming track full of plucked instruments (notably zithers and balalaikas), and the cue serves as the main theme for the film. Like more of the score, it balances right between the minor and major keys. Overture: M. Gustave H is another light track, with the bells and zithers in the forefront. Even listening to the album straight through, many tracks end abruptly. A Prayer For Madame D features the main theme, with a slight variation. The New Lobby Boy carries a new melody, overlapped and interspersed with the main theme. 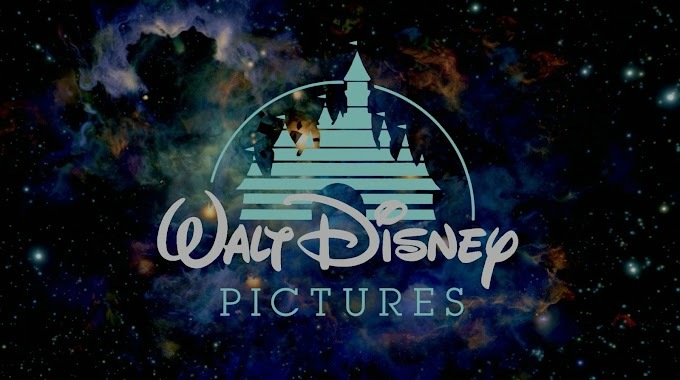 Concerto For Lute And Plucked Strings (composed by Antonio Vivaldi) fits with the plucking heard in the Desplat score and was heard in the film's trailer. Daylight Express To Lutz will take you back to the sounds of Fantastic Mr. Fox, ending with a timpani and percussion cadence. Schloss Lutz Overture has a nice Gothic organ, mixed in with the plucked zithers. The Family Desgoffe Und Taxis contains the main theme with slight changes instrumentation like the percussion and humming choir. Last Will and Testament begins with the foreboding organ before returning to the main theme. Up The Stairs/Down The Hall is a quick track of jingly bells, to describe it in a few words. Night Train To Nebelsbad is more of that Mr. Fox travel music, (something clearly Desplat and Anderson connect with). The similar music continues in the short The Lutz Police Militia. Check Point 19 Criminal Internment Camp Overture is a short sting introduction (11 seconds!). The Linden Tree (performed by the Osipov State Russian Folk Orchestra), a beautiful Russian folk song performed on balalaikas. J.G. Jopling, Private Inquiry Agent begins with the organ transitioning into the main theme, before the wordless male choir comes in, adding another texture into the theme. A Dash Of Salt (Ludwig's Theme) features more percussion and hand clapping. The Cold-Blooded Murder Of Deputy Vilmos Kovacs combines several variations and textures heard earlier in the score, with the twangy sounds, organ moments and shuffling rhythm. Escape Concerto has the wide variety of percussion with the electric bass line heard earlier in the score. The War (Zero's Theme) is a slower variation on the main theme. No Safe-House continues where the last track left off, slowly picking up the speed before the "bum bum" choir jumps in at the last second. The Society Of The Crossed Keys brings the orchestra to a crescendo, features more various percussion and pizzicato adding in several layers. I think this track stands out among some of the others. M. Ivan continues the electric bass, shuffling snare drum. Lot 117 begins with an organ pattern, with the twinkling bells heard earlier making an interesting polyrhythm. Third Class Carriage is another slower variation on the main theme, with the tremolo instruments having an almost shimmering effect. The twinkling bells make another appearance as well. With Canto At Gabelmeister's Peak, we get the longest track on the album. The style and themes from past tracks continue, with nice choral moments. We get some sections of vocal sections of the Kyrie Eleison and organ. A Troops Barracks (Requiem For The Grand Budapest) start with the snare and brass section before introducing more melodic material featuring timpani, bells, organ and balalaikas. Cleared Of All Charges features more of the upbeat variation of our themes. The Mystical Union features whistling alongside the balalaikas and zithers in that shimmering effect. Kamarinskaya, the Russian folk song (performed again by the Osipov State Russian Folk Orchestra) is a lively tune, fitting nicely with the original score heard earlier. Traditional Arrangement: "Moonshine" perfectly encapsulates everything about the score, tossing all the parts of the score and instruments and choir into a raucous track ending the album. It is nice to see a longer original score for a Wes Anderson film, but I found much of the album one-note and repetitive at first listen. Thankfully there are more layers and small changes that can be appreciated more with each listen. And I understand if some listeners don't make it past the first. I will say that the score works well in the film, and besides the organ and other certain spots the score is mainly quiet underscore to the quick dialogue. The short tracks (Thomas Newman is notorious for them) make the album sometimes a hard listen. The flow of the album feels stop-and-start because of the short tracks with abrupt endings. It doesn't seem like that in the film, because of the quick edits in the film. But thankfully the music is lively with a nice momentum and a good main theme. I enjoy the classical influences and Hungarian/Russian influences on the score, and should make many musicians run out to play balalaikas, zither or cimbalom. I can tell from the score that Desplat and Anderson share a vision. The film style and musical style share the complexity of layers, and meticulous details. 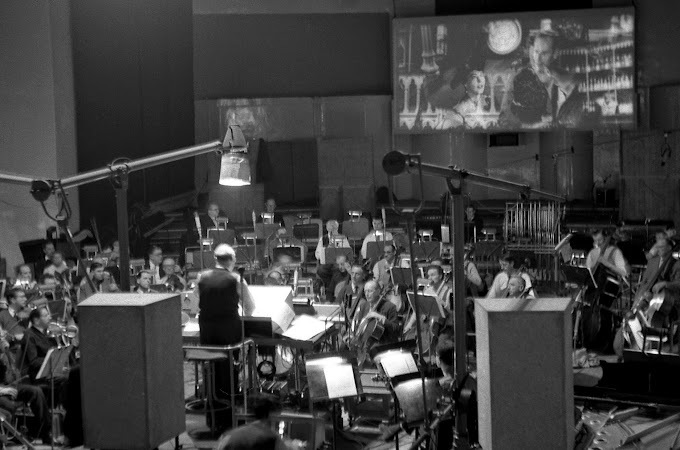 The backgrounds and settings of Anderson's films feel like the musical equivalent of Desplat's unique orchestration and instrumentation. Clearly they've been able to work well through Fantastic Mr. Fox and Moonrise Kingdom and now Grand Budapest Hotel. I hope this collaboration continues with more quirky and whimsical music to hear.